One day, we shall embed. Davis was hurt for a while and makes a triumphant return to board in this clip from The Berrics featuring him and Wayne, because that type of thing is pretty much the norm, nowadays. It seems significant that Dana managed to get his latest video into Labor in NYC. If you catch Mr. Ross speaking in the third person (i.e. "Pizza's been trying to quit pizza," I know...) call him on it. Vinnie's got you covered with a globetrotting nostalgic summer clip, featuring dudes you know, including Tom Rohrer, who continues to excel at skateboarding. The Hesh posted up a video of BUBD really fast after it happened (that I'm just know linking to), and also dug up a clip from six years ago showing a pretty typical Lair night from back when. In 39 days, the NBA season starts. On Twitter, there's an NPR hip hop account that that's been providing geekable material to me for about a week. Back out in the rest of the world, this Brad Cromer pro clip is quite proper. In case you missed it, the masters of the credit montage and the rest, Wiskate, posted Hurry Up and Try in its entirety. Happy weekend; a pet peeve is online sports columns that are made completely out of single sentence paragraphs. So guilty. 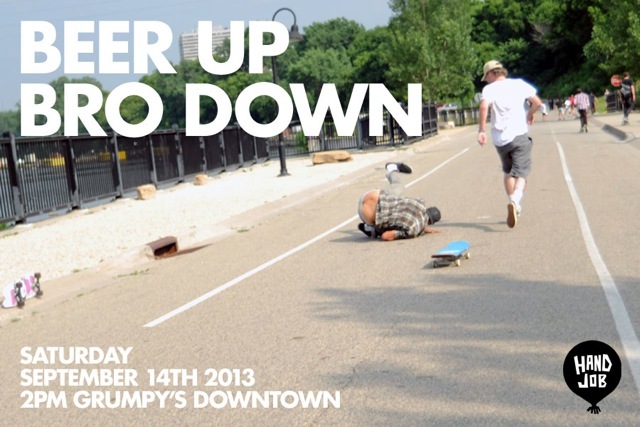 Beer Up Bro Down is back at the behest of many (or at least a handful of dudes that have talked to me) and Luke Hunt has decided to spark it off this Saturday. There are far too many stories of blood, guts and glory, nerd skaters and roused-rabble, for right here and now, but if you want to meet up with dudes, drink beers and push around on cruisers, always doing way more "actual" skateboarding than we ever thought would go down, here's the chance. Like The Hesh said, BUBD is a chance to show Pedalpubs what real four-wheeled street drinking is all about. Go get some. "A niche for dudes who make things happen both on and off the board. Welcoming Lakai Luminary [Steve Nesser]." The Hesh Dotcom handled the Filler 3 (Months) review a couple days ago. More later.